And if your article is irrelevant, then you’re not getting any traffic. Clicks are the best insight we have into what drives people to action. If you’re not putting click behavior under a microscope on every level, you don’t stand a chance at reliably building online marketing funnels that convert. But headlines like this typically create a lot of hype and under-deliver. You put effort into your content marketing, and you want the benefits to be clear in the title, right? 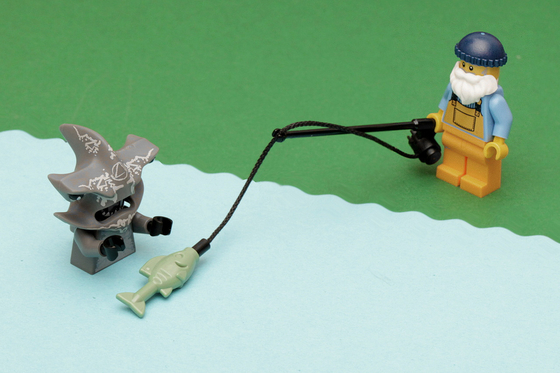 In short: how do you write clickbait alternatives that still get clicks? Here are six tips to equip you with the tools you need to write benefits-driven headlines that rise above the clickbait noise. “Clickbaiting” is when a publisher posts a link with a headline that encourages people to click to see more, without telling them much information about what they will see. Our minds are not content with the imbalance of disequilibrium — the lingering sense of incompleteness that we feel after reading a successful article title. So, we click. We pursue equilibration. However, just causing disequilibrium by leaving information out of the headline isn’t ideal for readers. Why not? Because readers want to know what to expect when they click a headline. They want to know what they’re going to get from reading the article. When we asked people in an initial survey what type of content they preferred to see in their News Feeds, 80% of the time people preferred headlines that helped them decide if they wanted to read the full article before they had to click through. So how do you create disequilibrium but still tell people what they’re going to get? Both of these headlines leave out enough information to cause readers to want more, but only the benefits-driven headline tells them what to expect in the full article. A study from MarketingProfs, featured on Ion’s Best of A/B Testing series, used A/B testing to show that benefits-driven headlines increased conversion rates by 28%. Answer the question. Make it unmistakably clear what the reader gains by investing time in your content. The pulling power of a magnetic headline traces to its promise. Simply stated, it’s a benefit. Benefits-driven headlines create the same disequilibrium that make clickbait headlines so effective. I’ll usually send two different subject lines to a percentage of the list. I’ll send 10 percent one version of the headline, and I’ll send another 10 percent a second version of the headline. After either a day or a couple of hours I’ll see which headline performs the best, and I’ll send that headline to the last 80 percent. So you’re ready to A/B test your headlines, but how can you start generating headline ideas? Often when you start writing a headline, people start writing and then they erase, and then they write some more and then erase, trying to create the perfect headline. If you don’t let yourself erase, if you just write them all out, you can see all the important keywords and all the best elements of each headline, and you can combine them into your final choice. The process of writing out a lot of headlines gets you closer to the best one. Creative and cutesy headlines perform really well for Upworthy, but for us, something like “The Marketer’s Guide to Data Science” performs really well because that’s what our target customer is looking for. As the Conductor chart shows, the headline “Ways to Make Drinking Tea More Delightful” lets the reader know that he or she will learn something about drinking tea – but the headline “30 Ways to Make Drinking Tea More Delightful” promises the reader 30 unique benefits. It also touches on the disequilibrium concept discussed earlier: when 30 potential benefits are listed, the reader begins to wonder what those 30 unique ideas might be, and part of the brain remains unsatisfied until the reader clicks and scans the list. 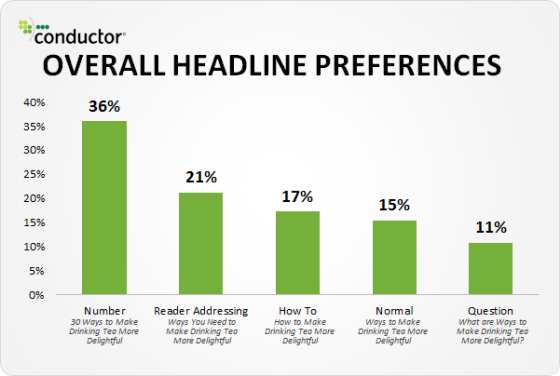 Including numbers in your headlines can make them 36% more likely to be clicked. When Alexis Grant generates headlines for her clients, she generally steers clear of using clickbait. Clickbait doesn’t work incredibly well if you’re trying to get a keyword into the headline. It’s more important to put the keyword in that describes the story. Instead, Alexis relies on keyword research and her SEO knowledge to write clickable headlines that drive long-tail traffic. “We’re looking for a headline that’s catchy but that also uses the keywords that we want the site to rank for,” Alexis told me. “We get a lot of traffic from search, and we get that traffic for a lot of reasons, but optimizing our headlines is a big part of it. Google Trends, which lets you compare different search terms and choose keywords that are likely to be high performers. Keyword Planner, which helps find long-tail keywords that give your site a SEO boost over time. Another thing that I think is really important, that a lot of people forget about, is the dek. Jessica makes the dek a big part of her marketing strategy. The dek is a really big deal, especially for social. The way our social editor uses the combination of the header, the subject line, the image — those things all come together and tell a story. Just remember to leave enough out so that your reader is still intrigued by what they’re going to click on. If you’re not seeing the click-through rate you want, try changing the dek. It’s as easy as updating it in your CMS, and you’ll quickly see whether you get results. I remember [the] days when Julia and I would spend 10 minutes, maybe 15, carving in stone a beautifully crafted hed and dek that would last the entire next day on the homepage. Now, Chad bounces a headline after an hour if it’s not performing! Your article not getting clicks? Write a complementary dek that speaks to the benefits of reading. Whatever you do, don’t tell us that we won’t believe what we’re about to read. In all likelihood, we’ll believe it. Your job is to make us want to read your article because of the benefits we’ll get from reading it. 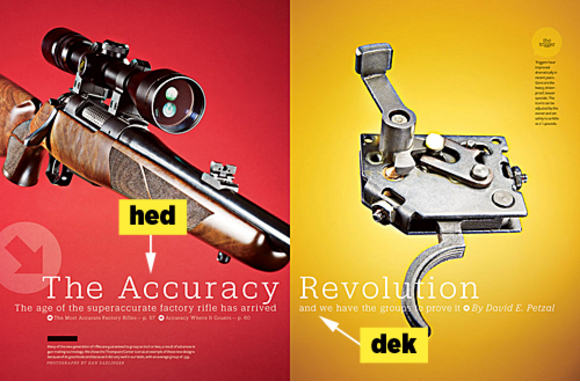 In return, we’ll click – and maybe even convert.